Today’s freebie is yet another addition to the clean and simple club – an elegant image slider. If you’ve into web deign, then you’re into sliders.. probably. The image slider would make a great addition to perhaps a portfolio or indeed any site which could make use of a gallery. 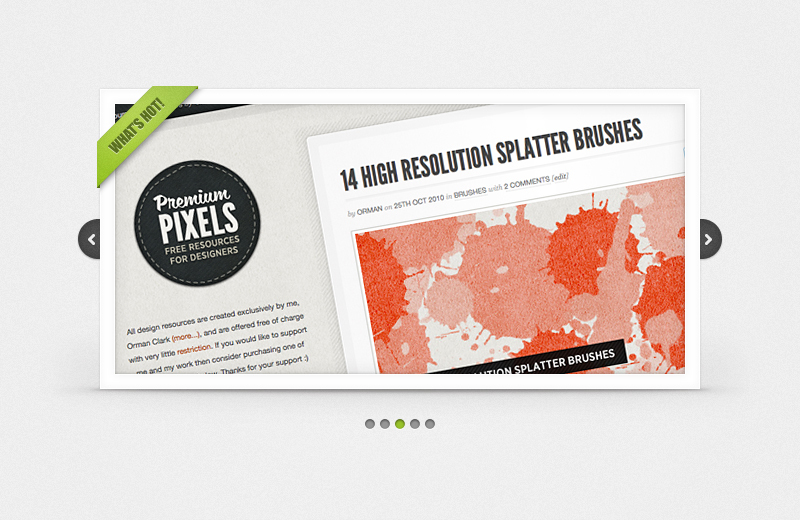 The download includes the editable PSD for your own customisations. Click the image below to view the full size preview. By the way, if you’re looking for a sweet little jQuery slideshow plugin you should definitely check out “Slides” by Nathan Searles. This is very cool Orman, I’m actually integrating it into a design as we speak. Thanks! Yes, this slide is beautiful! Thank you for allowing me to learn from your work! Agreed! So glad I stumbled upon this. Thanks for the organized files too…always appreciate the attention to detail. Great design man! One question though, how exactly can I integrate this into wordpress with lets say, slidedeck? Thanks and keep up the amazing work! Some nice stuff here on your website! Thanks for all that charity :) Very useful and very pretty elements. Your themes on Themeforest are also hot! Click the appropriate link in the last paragraph. Click the link to 365psd in the last paragraph. as always this is distributed under a really open license and if you need any help or support with it, let me know at my blog and I’m happy to help! Hi Orman! Is this Slider available for WordPress?? So sorry to keep commenting on everything I download, I am not Spam honest! I am just so chuffed that I have found a site with such a high level of design that I can actually download and look at how you have put it together. Really made my day! Inspired me also. Thank you! I need to float pagination above image. Can you point me in the right direction? Thank you so much yaaar!! Is it really free to use anywhere I want? Or do I have to past something somewhhere to use it on my webpage? which tag in jquery must be changed? It works great except for IE7 (and probably IE8) – as soon as I link to both CSS (my own and “Slides” – global), the “fade” effect disappears. Images simply load, without transition. When “position:relative;” is removed, the “fade” effect works but of course “Slides” shift to the edge of browser leaving layout behind. Did you come across this issue and solution?